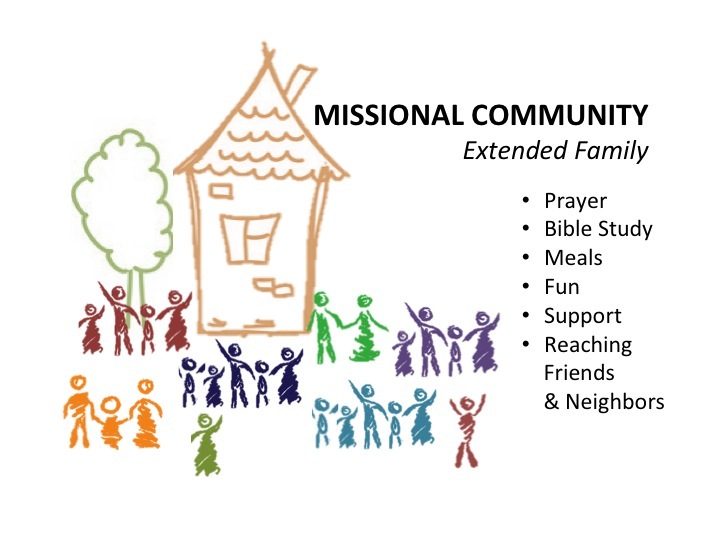 A missional community is a group of people, about the size of an extended family, doing the mission of God together outside the regular confines of the church building. Missional communities will operate with leaders leading groups larger than small groups to join God’s mission in the world. There is a dynamic interplay between these groups on the fringes and the resourcing, equipping center of a larger body. Missional communities are organizations of agile, networked organisms. A missional community is a group of anything from 12 to 20 or more people who are united, through Christian community, around a common service and witness to a particular neighborhood or network of relationships. With a strong value on life together, the group has the expressed intention of seeing those they affect choose to start following Jesus Christ, through this more flexible and locally expression of the church. The result will often be that the group will grow and ultimately multiply into further missional communities. Missional communities are most often networked within a larger church community (growing to include several other missional communities). These smaller communities, eventually to be led by laity, are “lightweight and low maintenance” and most often gather formally and informally numerous times a month in the group’s missional context. • Is a group of twelve to twenty people. In the Bible, we see these communities as medium-sized gatherings; they shared their lives together and reached out as a community to the lost around them. In fact, almost all of the letters Paul wrote were to churches with a maximum size determined by the number of people who could gather in a large home, which was probably fifty – seventy. Missional communities, at their core, are a community of people who love to be together and know how to have fellowship, as well as being a place of identity and generosity. This community is on mission together to affect a particular network of relationships or neighborhood, by incarnating the Gospel into that specific context through words and deeds. What we find in medium-sized communities is the ability to have a pioneering, low-maintenance, laity-driven vehicle on the frontlines of the missional frontier being resourced and equipped by a mission center where everyone can gather, celebrate what God has done, look at what he will do, experience a bigger story, and go back into the mission fields with fresh energy, vigor, and enthusiasm. We encourage missional community members to invite friends, family, neighbors, and colleagues to come and be part of the missional community that is an extended family of relationships. There is no test in order to come to a missional community. Just a simple a desire to discover more about God, to learn to follow Jesus Christ, and whatever one’s journey has been up to that point. Missional communities aim to offer a grace-filled, non-judgmental welcome in the name of the Father. Within missional communities, people seek to share their lives with one another day-to-day, so that this overflows into their formal meetings. The relationships in missional communities have to blend into “normal life,” or else they become yet another thing to clog up our schedules. In conclusion, missional communities recognize that their measure of success will be the stories of lives transformed, having an effect in the wider community being reached for Christ, of people being drawn closer to their heavenly Father. Such change happens in community rather than in isolation, since every aspect occurs with the love, challenge, and impetus of others, as everyone tries to live with one another as Jesus would. In short, they are a community on a mission.